No nylon wheels here. 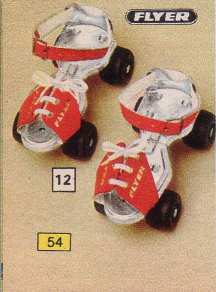 These were engineered ball bearing wheels and adjustable from size 9 junior to 8 adults. But let’s not waste time talking about putting our feet in them, no, these had other uses. We’d pull them apart and screw them to large pieces of plywood to make skate boards. Much more fun than nancy pancy roller skates.